Whether you want to learn modern or traditional calligraphy, there are many basic and fundamental questions that we all have about getting started. I completely understand being in that position! So I have created this guide that will help you find the answers and get you ready! 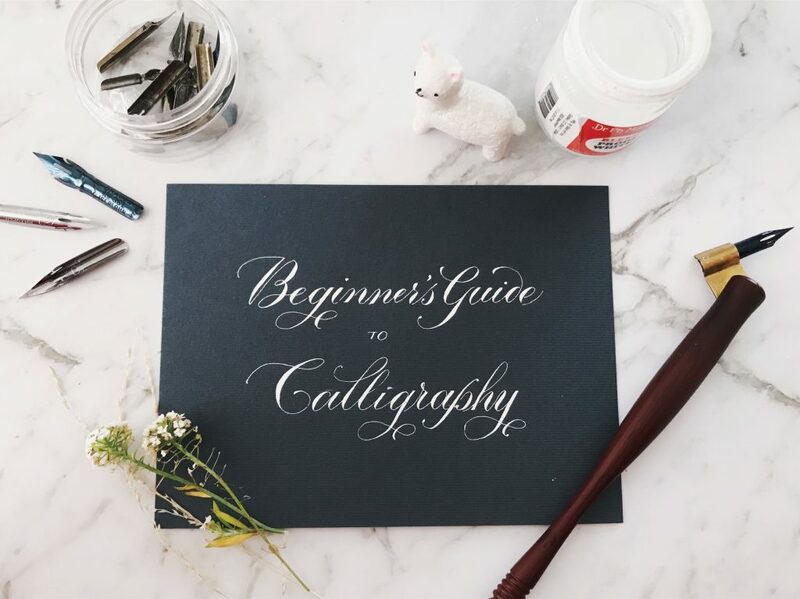 If calligraphy & lettering is completely new to you, don’t worry, we all came from here, and I’ll show you how to get through the first few steps! If you have already taken a start, you can still read this guide as I know the questions “what ink are you using…” and “what nib..what paper…” don’t always stop there. As I live in Australia, calligraphy materials can be quite scarce and hard to find. When I started, I had to purchase most of my materials online from overseas sellers. But luckily, now that calligraphy is becoming more popular, especially on social media, many art stores now carry some of the basic tools. There’s an endless list of pointed pen nibs, and I tend to like switching them around a bit and always try out new nibs. However, here are three nibs great for beginners as they are usually quite accessible in most places. I highly recommend starting out with the G nibs as they are stiff and touch nibs with very long lifetimes. Once you have had some practice, I recommend trying out different nibs. 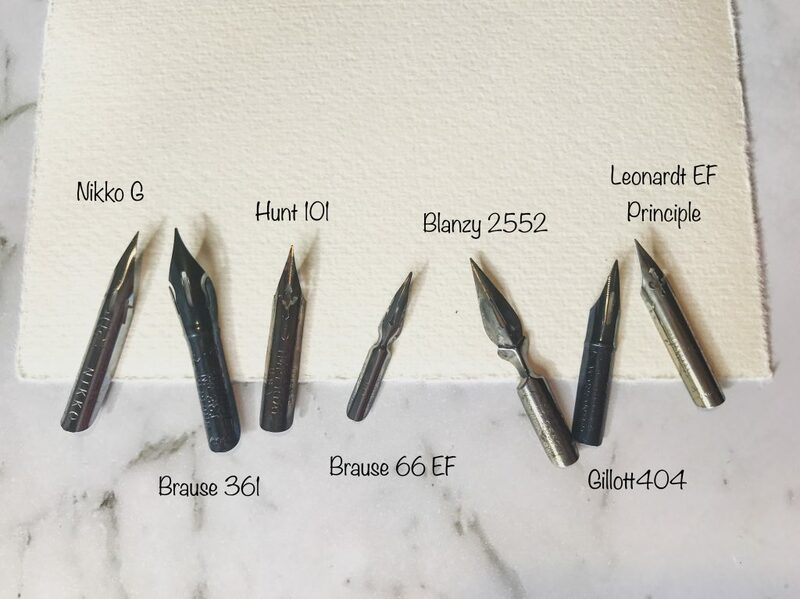 Every pointed nib has its own unique feel that’s not just limited to stiffness, and the key is to not rely on one single type of nib for your work. The most commonly used pen holders are straight and oblique. My advice is to keep a straight pen holder and an oblique pen holder with you. If you are serious or semi-serious about calligraphy, try to find an oblique pen holder that has an adjustable metal flange. For an affordable option, I recommend the ‘Moblique’ 2-in-1 Pen holder by Luis Creations (which I supply to all my students for my workshops) or the Yoke Pen Co ‘Deuce’ Pen holder. Both of these are designed by professional pen makers, so they are guaranteed to have the right balance in weight, flange angle and grip. The standard oblique pen holders can be used by both left-handed and right-handed calligraphers. My friend Younghae from Logos Calligraphy is a pro left-handed calligrapher and she has some tips on how you can go about it if you are also left-handed. When it comes to picking ink, note that more expensive ink does NOT equal more user-friendly ink. The result of your ink can really depend on what surface you are writing on. My go-to practice inks are: Sumi ink (Daiso works great! ), Walnut ink (see below), Higgins India/Eternal ink and Dr Ph Martin’s Bleed proof white ink. Dr Ph Martin’s Bleed-proof white is my favourite white ink. The name says it, I still haven’t found one surface where this ink bleeds on. It comes in a thick paste when you first open the bottle (and most of the time, the pigments are suspended from the clear liquid). To use it, I like to scoop some out into a dinky dip (mini ink jar) and mix water in until it reaches the right consistency (flows out smoothly, colour should be opaque, not translucent). Walnut Ink is one of my favourite inks for practicing! 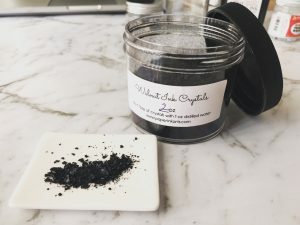 I usually buy them as a large container of walnut crystals and mix the ink myself. Leave it there for 10 minutes, no stirring is needed! Cartridge paper (printing paper) can also be used for practice, but not all printing paper are made equal when it comes to ink. I have tried a few different options and I have found this one to work quite well with walnut ink. Printing paper are generally much cheaper and great for practicing, but make sure to test them out for bleeding before you purchase a bulk. Now that you have prepared your materials, we will need to give your nibs a little more attention. It will save you a lot of frustration! Brand new nibs are coated with a layer of oil/wax/(some kind of hydrophobic material) to stop them from rusting. This means that a brand new nib is unable to pick up any or enough ink for writing until this layer is removed. Nibs vary vastly in size, thickness and hardness, so it’s important to avoid any methods that might damage a new nib. 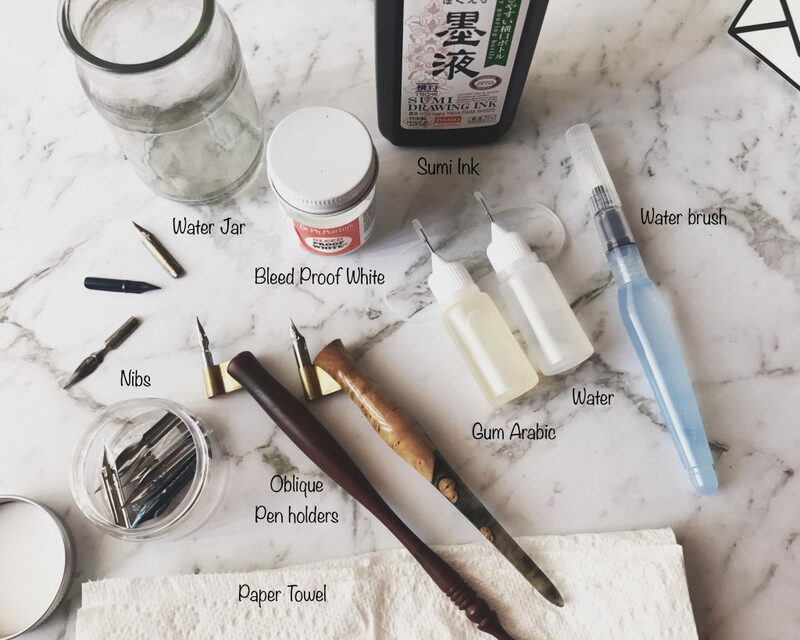 You can definitely go and buy a nib preparation chemical to remove the protective layer, but there are several methods which only require things you already have lying around at home, and the results are the same! Toothpaste (avoid whitening): This is what I used from the very beginning, it works for almost any nib. Use a Q-tip and give the inside of the nib a good rub with toothpaste, then wash it off completely. 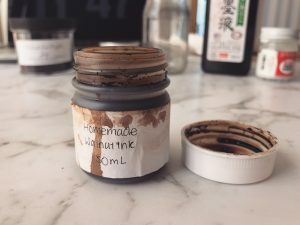 Here’s how: I like to use my walnut ink to prepare my nibs (cheapest ink I own). Simply dip them into the walnut ink for a few seconds and then gently rub the inside of your nib with a paper towel. Repeat this a few times. Now try dipping them into the ink again, if the ink is being held inside the nib, with the hole covered, it means your nib is ready to go! Potato: Yup, you read it correctly! Potatoes actually contain an enzyme that breaks down the protective layer, so recently it has become a trend to stick nibs into a potato for preparation. This is a great idea if you need to prepare a large number nibs. All you need to do is gently stick your nibs into the potato, just past the vent hole, and then wait fifteen minutes. Then pull them out and give it a rinse, and they’ll be ready to use! Make sure to set a timer as over-prepping the nibs will damage them! When using an oblique holder, there’s a simple rule of how deep your nib should go inside the flange. 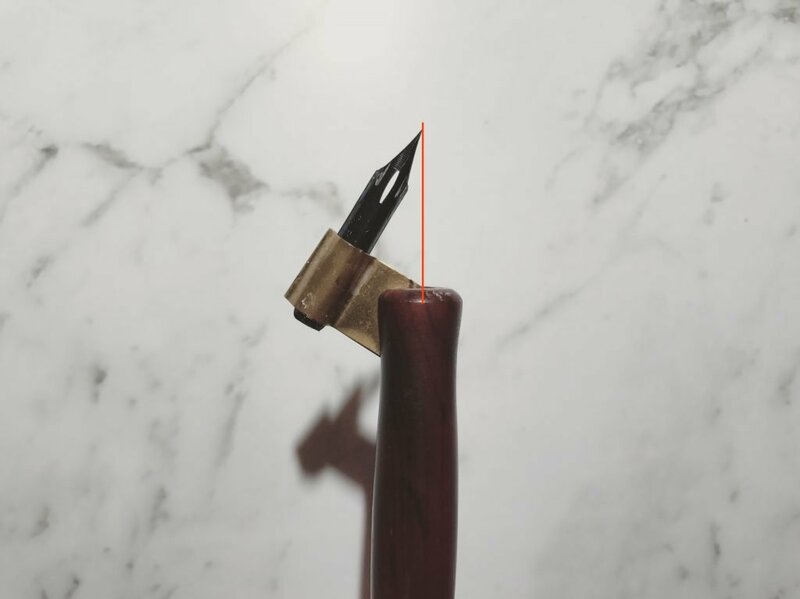 As shown in the picture above, the nib goes deep enough so that the tip of the nib aligns with the centre of the holder. If you own a flange plier, you can easily adjust your flange to fit different nibs. Otherwise you can also gently push the flange with your hand to adjust its shape for different size nibs. However, try not to regularly adjust the flange as this can damage the pen. So I recommend owning at least 2 oblique holders to fit the general “large” and “small” nibs separately. This might be the most fun part of starting calligraphy. We are going back decades to use the dip pen again. So here is one simple rule, the dipping depth should be just above the vent hole of the nib, which allows it to hold a good amount of ink. As shown above, the ink should not reach the flange, as it can get trapped in the flange and damage both the nib and the flange. 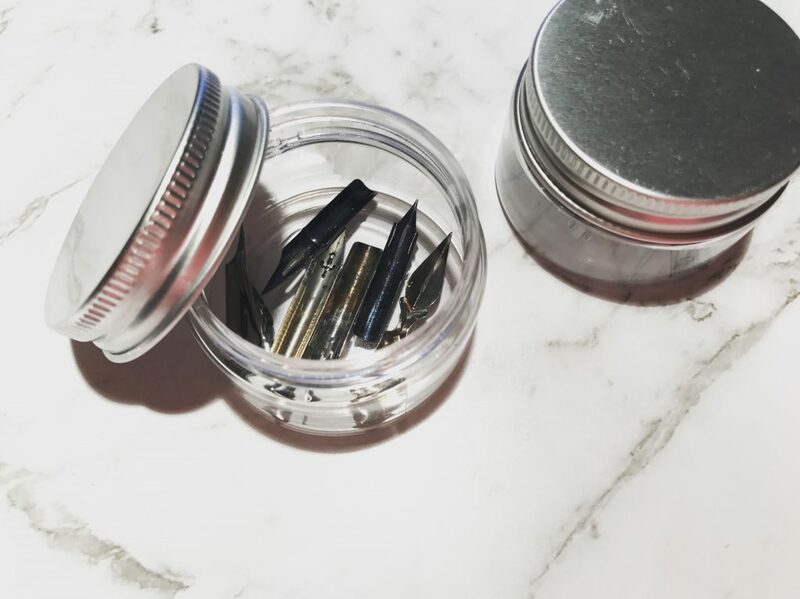 After cleaning your nibs, let them dry completely and store them in a sealed nib container or tin. I use small cosmetic tins to store them. Enjoyed reading this blog? Sign up to our newsletter so that you get notified when I write a new one! Don’t worry, spamming is not our thing! Thank you for the input. It make a big difference, as a beginner, knowing all these little details about Calligraphy before starting. I have been getting all the needed supplies to start practicing and just finding myself looking at them and thinking: now what? What I would love to find, and still searching for it, it’s a left-handed oblique pen with the adjustable flange. Is there such thing or Am I hoping for too much? Thank you again for sharing your beautiful gift with all of us. ❤️ Love seeing your work. – In reply to: Idalia M.
Great job.. everything to start!! Thanks for sharing Char! It was super informative and I also love your marble background! Looking forward to reading more posts! Thank you for this beautiful post. I’ve already learned so much calligraphy from your instagram.😍 I’ve been working on pointed pen calligraphy for months. What I still struggle with is that I don’t know how I should dip the nib in the ink so it holds the ink long enough to write at least one whole word, let alone a whole line! I’m beginning to think it needs some sort of magic!😓 I even use brush to apply ink on the nib, still the ink doesn’t flow easily on the nib. Wauw super beautifull and iff you do it it sees so easy. Can t waight for more tips. THanks. Magnific! Splendid! Un manual cu modele de litere? Din România, cu drag! Love this! <3 So helpful as I did my nib shopping. I found yer website looking for “Charlotartscript”. Thank you for the explanation. Other than the flourishing, how is it different from USA cursive? A friend gave me the Learn American Handwriting, (vols 1, 2) which I will attempt to learn Spencerian, but I need to learn Copperplate, first. wow this is fascinating. i just wonder where i could buy the materials. i love writing and i think this would help me develop my skills.